يحظى فندق فندق إيبيس سيدني كينج ستريت وارف بمكان متميز في محور سيدني تسوق, سياحة, مطاعم في منطقة Darling Harbour الفاتنة. إن موقع الفندق الاستراتيجي، الذي يبعد 1 km فقط عن مركز المدينة، يسمح للنزلاء بالوصول سريعاً وبسهولة إلى العديد من الوجهات المحلية المثيرة. كما يمكن الوصول بسهولة إلى سيدني شو بوت, ماجستك كروزس, Harbour Jet. إن الخدمات الممتازة وحسن الضيافة العالي في فندق إيبيس سيدني كينج ستريت وارف تجعل إقامتك تجربة لا تنسى. إن مكتب الاستقبال على مدار الساعة, مرافق مخصصة لذوي الاحتياجات الخاصة, تخزين الأمتعة, واي فاي في المناطق العامة, صف السيارات هي جزء فقط من الخدمات التي تميز فندق إيبيس سيدني كينج ستريت وارف عن باقي الفنادق في المدينة. في فندق إيبيس سيدني كينج ستريت وارف غرف نوم يزيد عددها عن 91 صممت بذوق وعناية لتوفر لك كل وسائل الراحة . بعضها يحتوي أضاً على تلفزيون بشاشة مسطحة, غرف لغير المدخنين, مكيف هواء, مكتب, تليفون. إن مسار جولف - ضمن 3 كم هو المكان الأمثل في الفندق للاسترخاء وتفريغ طاقتك بعد نهار طويل. استمتع بخدمات لا يعلى عليها وعنوان ذو اعتبار في فندق إيبيس سيدني كينج ستريت وارف . يجب على النزلاء عند تسجيل الوصول تقديم بطاقة هوية صالحة وبطاقة ائتمان سارية يكون الاسم المذكور فيهما مطابقًا للاسم المذكور في الحجز. يخضع العقار للتجديد من 15 مارس 2019 إلى 29 أبريل 2019. سيكون هناك ضجيج في بعض المناطق من الساعة 10 صباحًا حتى الساعة 4 عصرًا. لطرح أي استفسارات أخرى، يُرجى الاتصال بالعقار مباشرةً. This is a typical IBIS hotel, basic, small rooms, minimal facilities, but good value. the best thing is the location - a stones throw from Darling Harbour and in the CBD, so very quiet at weekends. Parking is pretty restricted, but there is a multi story across the street at $55 per night. Bar and food options are very limited. GREAT LOCATION! This CLEAN room is smack on King Street Wharf! Tons of photo opportunities. Plus many good restaurants. Short walk to Darling Harbour. Walk to convenience stores just 50 meters to the left. [Right in across Ibis is the King Street Wharf bus stop no. 20 as we purchased the Hop On Hop Off Sydney tour package separately.] There is coffee & tea which we enjoyed (or fresh brew at the lobby for AUD$3.50) If you arrive early, hang out at the comfortable & spacious lobby and play some board games) This is a great place to stay for visiting Sydney! Highly recommended. Our room with a queen bed did not have a safe. Our teenagers room with 2 single beds had a safe. It's in such a convenient location. Walking distance to the famous darling harbour, Madam Tussauds and great restaurants at Kings street wharf and across the bridge to QVB for shopping, the Barangaroo developments has really transformed the area. I didn't give 4 stars for the facilities because the room we stayed in was tiny. A bit like staying at a hotel in Japan. But for a couple of nights to visit the best of attractions in the world famous harbour city is well worth it. Just so you are concerned, there is no free wifi and it's quite expensive to buy a wifi plan there. Besides that, everything looks good, close to classy restaurants and shops since its basically inside CBD. We had pleasant stay at Ibis Sydney. The hotel should be quite new and clean. Room is not very spacious but acceptable. Staff was friendly and helpful throughout our stay. Location is convenient to major attraction in Sydney. We did a lot of walking in the city even though train station is not far from the hotel. 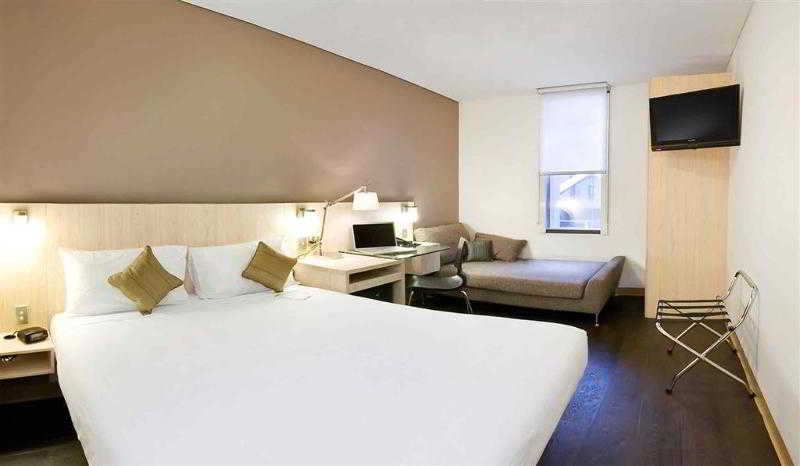 Internet is chargeable in room but its not difficult to find free Wi-Fi spot in Sydney. 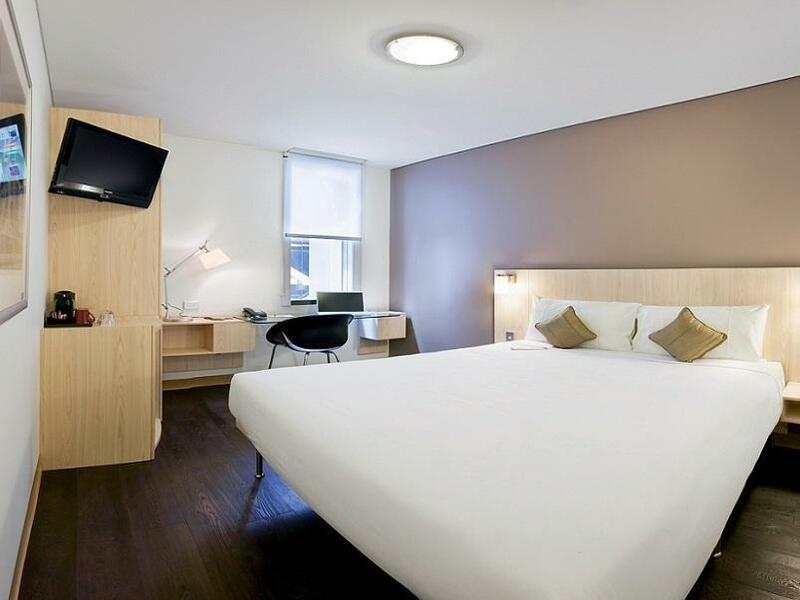 Overall stay is good, hotel is clean even is not too much space and location is really great, walking distance to heaps of restaurant, just opposite of ferry sydney darling harbour, Madam Tussaud and zoo. no bag deposit. cost 7 bucks for the locker. small window , no gym. or pool. friendly staff. right next to great cafe and restaurant. the room is very very clean. no smell carpet coz there is no carpet. the room are tile floor but it does look like timber floor. see picture for detail. 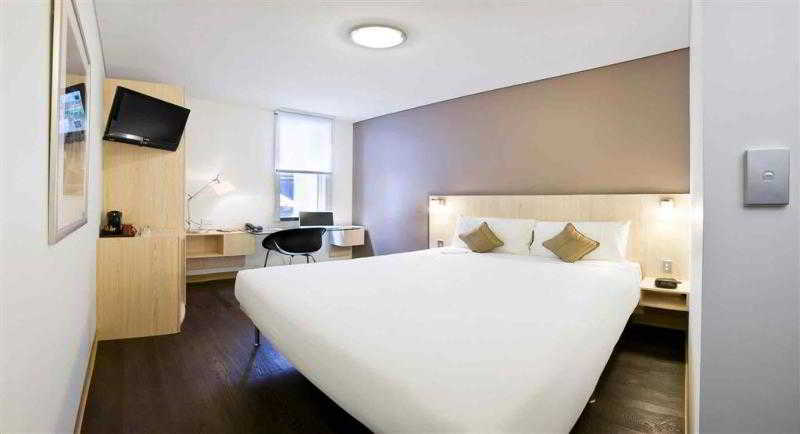 room is very tidy, big tv, curtain is great, it makes the room really dark during daytime. great locations no bag deposit. cost 7 bucks for the locker. small window , no gym. or pool. The hotel is just behind king street wharf where lots of drinking area and Very happening. 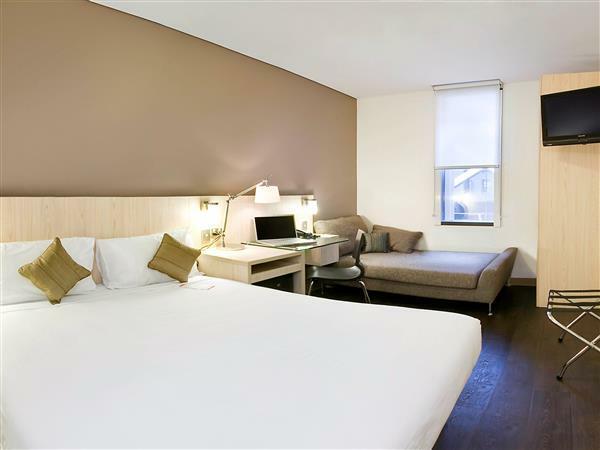 8mins Walking distance from Wynyard station, as well as town hall station. Take ferry from wharf 7, go Circular Quay, Watson Bay, Pyrmont Bay. Cheap cheap. Room is rather small for its price but staff is friendly to let us check in around 1pm. Pls bring your own tooth brush and tooth paste as they do not provide. Good location close to wynyard station and right on the wharf so close to restaurants, the harbour, new barangaroo area and a nice walk to circular quay. Sydney accommodation near the water is always expensive so comparatively this was priced fairly considering it's location. Thank you Emma. I am glad that you enjoyed your stay in our fantastic location. Staff were so extremely helpful ! 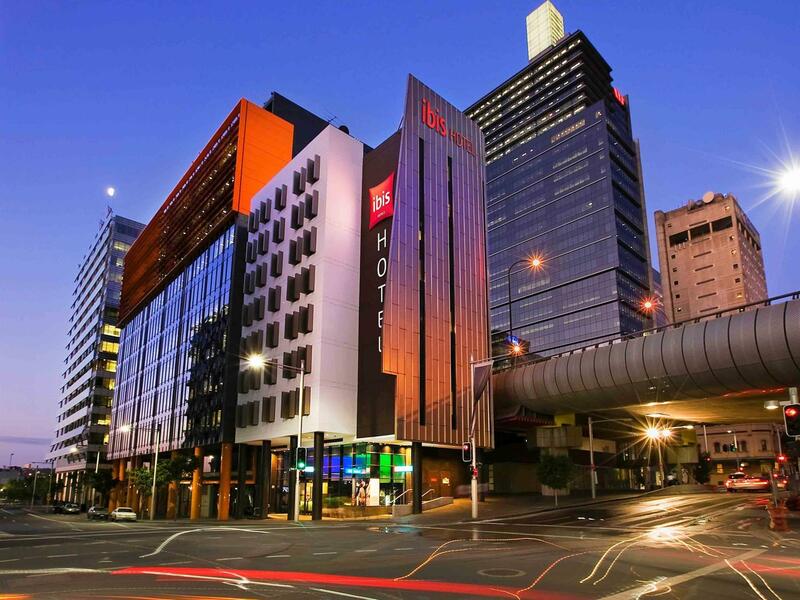 We had accomodation through a friend cancel on us last minute and Ibis Hotel Sydney King Street Warf, we’re so accomodating and just absolutely nailed everything completely to helping us book a room last minute, to free room upgrades and drinks for my birthday ! The check in guy at the reception desk was a legend, I can’t quite remember his name but he went absolutely above and beyond to make sure we had what we needed ! Definitely ONLY staying at Ibis Hotel Sydney King Street Warf from now on ! Thank you Nicholas! I have shared your comments with the team who are very excited that you enjoyed your time with us. We hope to see you again soon. The building is very old even it looks new from the picture. The lift makes a lot of noises which is very obvious during the night. I lost my whole night sleep, I can clearly hear what the late arriver (1:00pm) talking about in the room next to me. If you are noise sensitive, please don’t book this hotel. Thank you for your review. We are sorry to hear that you did not enjoy your recent stay with us. We wish you all the best in your future travels. Thank you Nico for your fantastic review. I hope we will see you again on your next trip to Sydney! I associate Ibis hotels with cramped bedrooms and minimal service, so this was a pleasant surprise. Furnishing are very basic but the bedroom was a good size and comfortable. Service was friendly but basic. There is a bistro/bar on the ground floor but that is all you get. Don't forget that the hotel offers a specially reduced parking charge at the secure parking facility across the street. The room was so tiny you could not swing a cat.The location was excellent,in the heart of restaurants at Darling Harbour,ferry at doorstop.I booked through Agoda & never again,I booked online for $104 aus per night which was all it was worth & was then charged in us $'s $281.88.When I tried to query was advised that the amount online was us$'s & because it was an overseas call centre where does it get you! Loved my (brief) stay for a business meeting. Great location, perfect room with all the facilities I need and exceptional service from all the staff I encountered. I love it & will be back anytime I need to stay in the city again!